Kia Motors today announced that it expects to reach the 15 million cumulative export (from South Korea factories) milestone later this month. This landmark achievement comes 40 years after its very first export shipment of 10 units of the Brisa pickup truck to Qatar in 1975. Put into a different perspective, 15 million Optima sedans, each measuring 4,845 mm in overall length, would circumvent the earth (40,000 km) 1.8 times when lined up bumper to bumper. Cumulatively through May of this year, the B-segment Rio has been the number one exported Kia model with 2.23 million vehicles shipped, while the Sportage compact CUV, A-segment Picanto and Sorento midsize CUV follow with 1.57 million, 1.43 million and 1.08 million units exported, respectively. In terms of the regional breakdown of Kia’s historical exports, 6.03 million vehicles have been shipped to North America, 3.35 million to Europe, 2.52 million to the Middle East &amp; Africa, 1.71 million to Central &amp; South America (including the Caribbean) and 1.29 million to Asia Pacific. Following the 10 million export milestone reached in March of 2011, it has taken Kia only four years and three months to hit 15 million exports, which is one year and nine months less than it took the company to grow its export volume from 5 million to 10 million vehicles. 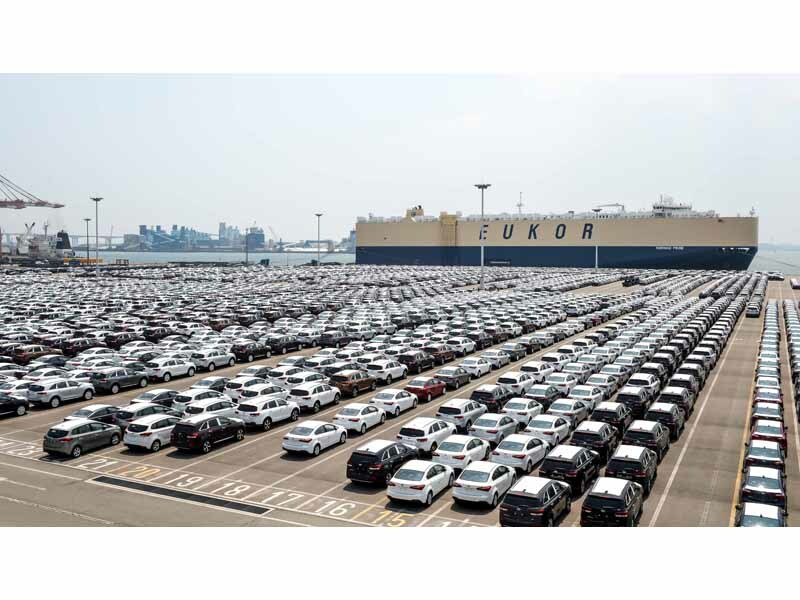 Furthermore, while it took 30 years to surpass the 5 million export mark, Kia will ship its 15 millionth vehicle after only an additional 10 years. Kia vehicles are currently manufactured at a total of four manufacturing plants in South Korea, which have benefited from continuous investment into production facilities and technology to ensure an efficient domestic manufacturing system that places quality at the core of every step in the vehicle assembly process. The company has also expanded annual production capacity in Korea from 800,000 units in 2000 to 1.71 million units in 2014 with over 70% of domestic production exported to overseas markets. This domestic production network is complemented by a growing overseas manufacturing presence for the Korean automaker which is currently operating five state-of-the-art production plants located in the U.S. state of Georgia (Kia Motors Manufacturing Georgia), Slovakia (Kia Motors Slovakia) and China (Dongfeng Yueda Kia Motors). Meanwhile, Kia’s first manufacturing plant in Mexico is currently under construction and will add another 300,000 units to Kia’s annual global production capacity when mass production commences at the plant in mid-2016.